The things that differentiate us are real, and razor thin. Barisal Devision, Bangladesh - A Rakhine man washes up with water from a deep-water well in the southern delta region of Bangladesh. Clean water is about more than just drinking. Parasites and chemical toxins are absorbed through the skin, often leading to long term health complications for impoverished communities. Dhaka, near Jamuna Future Park, Bangladesh - A family bathes and washes laundry after a long day of work in Dhaka. A lack of access to safe water leaves people in both rural and urban areas exposed to disease, parasites, and chemical run off. In Urban areas these problems can concentrate because there are fewer bodies of water and denser populations. A pond like this maybe visited by hundreds of people and animals in a day. 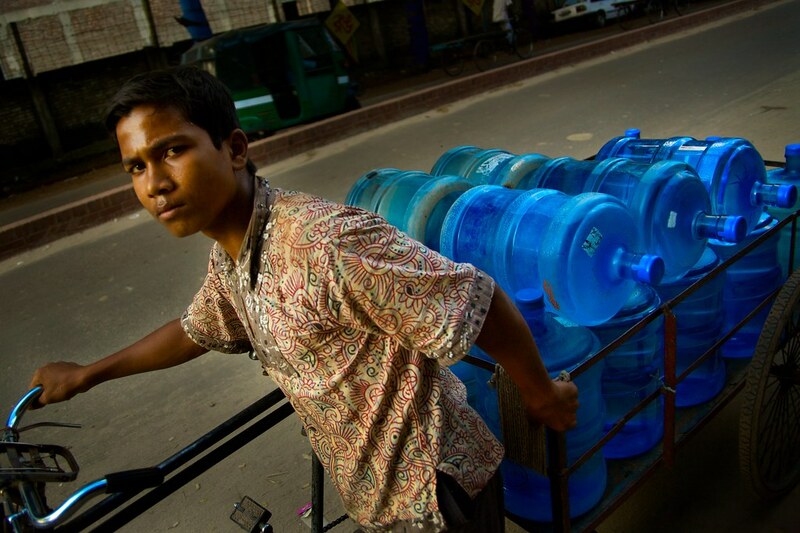 Dhaka, near Jamuna Future Park, Bangladesh - A young man pulls a cart of plastic jugs filled with purified water. As the rivers that feed Bangladesh's water supply become more inundated with biological and industrial waist from neighboring countries upstream, Bangladesh must because more reliant on costly filtered water to for drinking. Tea Harvesters in Bangladesh earn roughly .75 USD per day. This is only enough to keep them alive. This is a series of clips from my recent trip to Bangladesh last month, they were all shot while waiting in traffic in Dhaka. Everything but the first two clips was shot "over cranked" at 48fps. In Dhaka: a dense urban landscape, the streets are crammed with Bicycle Rickshaws. Rickshaw drivers, called Wallahs, decorate their vehicles with bright colors and gold and silver foils to attracts attention and fairs.